Ergonomics can be simply defined as the study of people’s efficiency in their surroundings. It is the relation between the human body and its work that represents the physiologic, anatomic, and mechanical principles affecting the efficient use of human energy. Why is it important to understand the science of ergonomics? By understanding the importance of ergonomics in daily life, you can easily learn how to prevent pain or injury and make your every day more comfortable. All you need to do is make little changes in the body posture, lifting techniques & working habits. What do you need for an ergonomic body? Motion – The joints in your body need movement! Continuous movement prevents the joints to turn stiff. Flexibility – To help prevent injury, your body requires flexibility in muscles, joints and ligaments. Strength – To be able to shield the joints from any harm and keep you upright, your muscles need strength. Considering how dense the traffic in Delhi/NCR is, it is obvious that people spend a fair amount of time driving their cars. Many people feel exhausted by the end of the day for driving in such a state of traffic. And while one might not realize it instantly, but having a bad posture while driving can result in severe and recurring back pain. Here are few posture tips that can help you keep your spine healthy. To remain engaged in an activity for many consecutive hours can lead to microtrauma in the body. If a person sits at a workstation in an improper posture, then the postural muscles supporting joints and structures in the body get weakened over time. 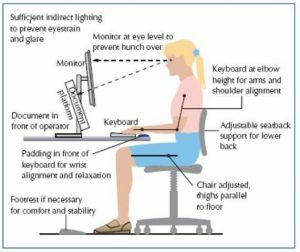 If your work demands you to sit in front of a computer for a good 6-7 hours, then you need to know the right posture. Rest your elbows on the armrest at a 90-degree angle. 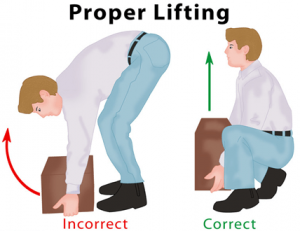 Adjust the chair height to get thighs parallel to the floor and feet to rest flat on the floor. Sit on a high back chair to support your shoulder blades. Set your monitor/screen at eye level. Adjust the seat back to give support to lower back. Do you put your wallet in your back pocket? If yes, then that too is affecting your body balance & posture. Our body likes balance & symmetry. Keeping the wallet in the back pocket creates uneven surface while sitting and results in a bad body posture & hence is one reason (albeit a minor one) behind back pains. The weight of a handbag that an average woman carries is 3 kgs which include laptops or iPads, water bottles, makeup essentials and children’s necessities. Wearing these bags on one shoulder leads to subluxation that results in neck pain, shoulder pain, as well as headaches. Look for alternatives to handbags such as pull along trolley bags or backpacks if you have to carry a lot with you. High heels! Do you believe that wearing high heels bring you closer to heaven? Well, these high heels MOST DEFINITELY bring you closer to osteoarthritis. Wearing high heels for a long time can create an unnatural posture through the spine which can lead to long-term pain and dysfunction. Keep your high heels for the dinner dates where you don’t have to be on your toes every time, or better wear wedges that give a comparatively better & balanced posture. Handheld devices are another reason for bad posture. Continuously looking at mobile phones, iPads or laptops usually cost you your good posture. Limit your use of handheld devices to take better care of your body. Owing to lethargic lifestyles and rigorous working hours, a lot of people complain about pain in the neck, shoulder, wrist, upper and lower back and elbow joints. This happens due to the compressed nerves that cause weakness or tingling in the muscles leading to either pain or numbness in a particular body part. Pain & discomfort associated with ergonomics can be prevented by adopting the right posture techniques but if the symptoms continue to occur, then take early corrective actions. A physiotherapist has an in-depth understanding of ergonomics and work-related conditions. A physiotherapist listens to the symptoms and assesses before providing appropriate treatment. In a consultation session, he also identifies and advice the individual about the correct posture to perform daily tasks at work as well as in daily life.